An ITG Diet favorite! 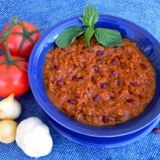 This rich, hearty chili is great on its own or full of fresh sliced vegetables for a perfect meal. Add a dash of sugar free hot sauce or cayenne pepper for extra heat!